> Blog > What’s the difference between a barge and a ship? What’s the difference between a barge and a ship? Simply said, ‘ship’ is a generic term for any watercraft of considerable size that is used for the transportation of people or goods. Meanwhile, a ‘barge’ is a long, flat-bottomed vessel traditionally used to transport goods (and now, also people) through inland waterways. So, technically a barge is a ship, but the key difference here is that barges seldom leave inland waterways or seaport areas. Whereas ships sail both here and in international waters. Easy, right? Wrong. So what is the difference between a barge and a ship then? Judging from this previous distinction, any river-traveling ship could be a barge — not true. As mentioned above, barges are flat-bottomed, a design which enhances their cargo-carrying capacity and hints at their heritage: Before the industrial revolution (and as far back as the 16th Century), canals and locks were the main transportation routes for cargo, and barges were used to ferry goods to trade destinations connected by small water bodies. Although the industrial revolution made this transport mode largely obsolete with the steam engine and trains, barges are still used to transport particularly heavy or bulky goods, some of which — unlike self-powered ships — are engineless “dumb barges” moved by tugboats. Moreover, this shift freed up Europe’s canals for future generations of pleasure boaters! Importantly, the narrow size of Europe and Great Britain’s canals and locks explains another major difference between barges and ships — barges must be long and slender in order to negotiate these venerable and modestly-sized waterways. In the UK, barges are mostly ‘narrowboats’ seven-feet wide or less, whereas the average ‘widebeam’ Dutch barge is a little broader, but still much thinner than your average ship. And then we also have luxury barges and sailing ships — but let’s not add these in the equation. But where do passenger barges fit in? Glad you asked! Nowadays, many cargo barges are being gutted and completely renovated to hold more precious cargo, either as stationary houseboats or as passenger barges. But not all passenger barges are created equal. Some emerge as casual recreational vessels with sleeping space for less than a dozen people and modest kitchen and bathroom facilities; however, others turn into floating boutique hotels that can fit a couple of dozen passengers and feature en-suite bathrooms, free Wi-Fi, dining salons and comfy bars. Hotel barges with hot tubs and saunas are not unheard of, and there is usually space for carrying bikes for (spontaneous) exploration as the barge cruises through lovely landscapes. Just like river cruising, right? Not quite, but we understand the confusion. River cruisers are indeed long and narrow so that they can fit through river locks, but these ships often carry more than 100 passengers and wouldn’t get far in Europe’s smaller canals. Furthermore, they often have two to three decks and a sundeck, as well as more space dedicated to onboard entertainment and larger quarters; in summary, they’re tailored to those who just want to watch the world pass by and disembark for the occasional excursion. On the other hand, barges provide a more intimate experience with closer living spaces that are perfect for family and friend group charters or mixed trips with like-minded travelers. 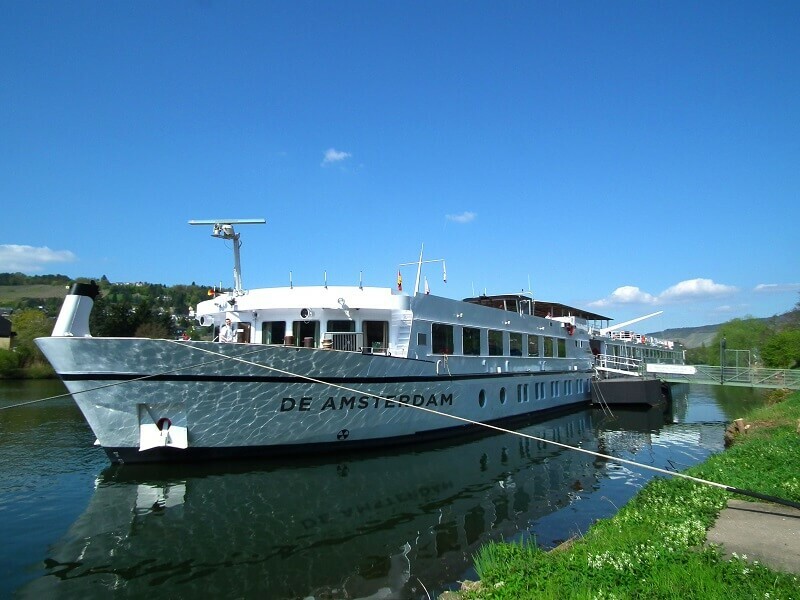 Boat Bike Tours has both; for example, the Fleur which takes barge trips through Belgium, Holland or France, and the river cruiser Arkona, which travels the Rhine and Danube. And here is where we find the final and most important difference between a barge and a ship: barges generally travel much slower, letting you explore at a much more relaxed pace! 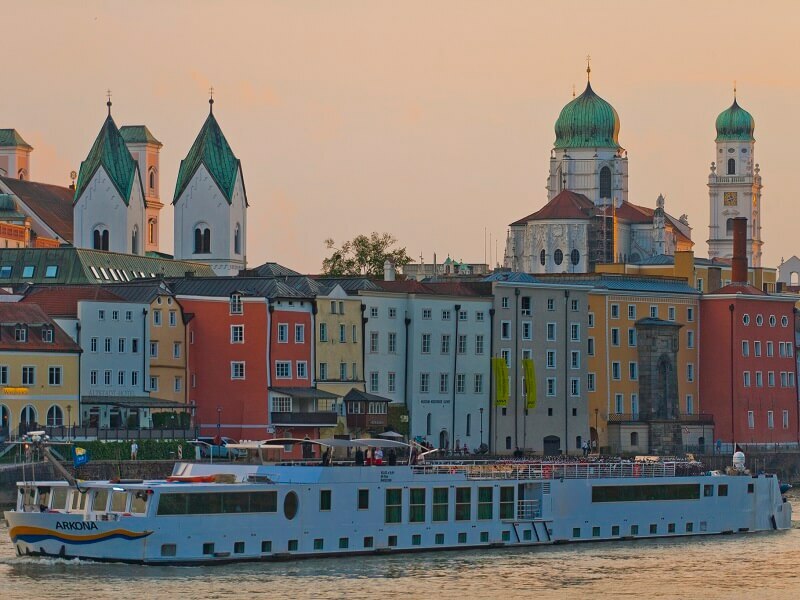 While a river cruiser may travel through several countries, a barge may explore just one or two regions up close — at a speed that lets you set out for a leisurely cycle tour or even walk alongside the barge during the day and still be home in time for dinner on board. 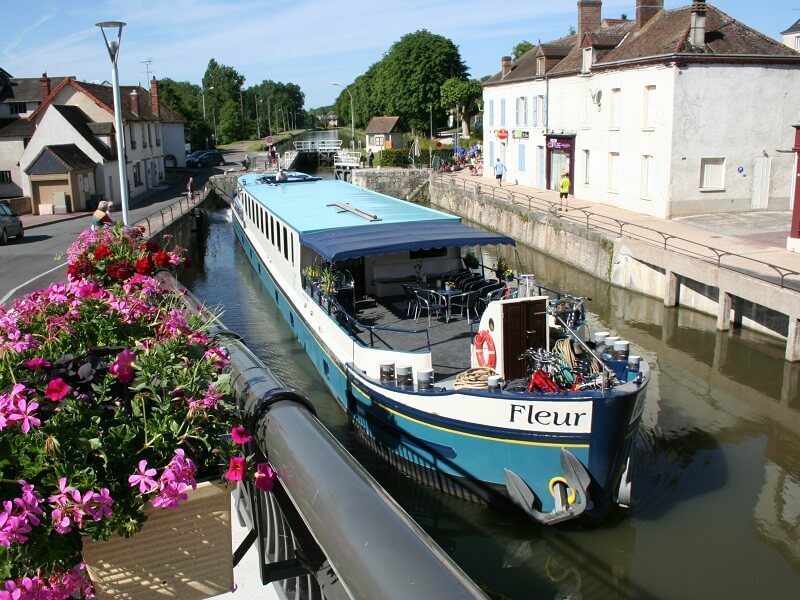 And while river cruisers are known for elegant dining, the smaller sizes of barge trips means that these are increasingly becoming gourmet affairs since your chef can simply hop overboard and bike off to a local market, winery or boulangerie to pick up tasty local treats! Curious to find out what makes a boat bike tour so unique and special? Join one of our trips!